Editor’s note: This is an archive of a report on Ponzi schemes that originally appeared on the Social Security Administration’s website in January 2009. 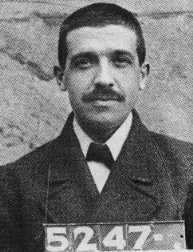 Charles Ponzi was a Boston investor broker who in the early months of 1920 was momentarily famous as a purveyor of foreign postal coupons who promised fabulous rates of return for his investors. Ponzi issued bonds which offered 50% interest in 45 days, or a 100% profit if held for 90 days. The supposed source of this windfall was the differential earned on trading in postal coupons. The actual profit on the postal coupons never amounted to more than a fraction of a penny each, but it didn’t matter to Ponzi since this was not the true source of his profits. Ponzi opened his company, “The Securities Exchange Company,” at 27 School Street in Boston the day after Christmas 1919. He was penniless at the time and had to borrow $200 from a furniture dealer in order to furnish his new office. Within days he was collecting money from his initial rounds of investors. He then expanded the circle of investors by collecting money from a larger round of investors. When the bonds of the first investors came due he paid them, with their miraculous profit, using the money collected from the second round of investors. The news of these extraordinary profits swept up and down the east coast and thousands of investors flocked to Ponzi’s office for an opportunity to give him their money. Using the money from this new surge of investors he paid off the next round of bonds as they came due, with their full profit, which excited even more frenzy. The problem with Ponzi’s investment scheme is that it is difficult to sustain this game very long because to continue paying the promised profits to early investors you need an ever-larger pool of later investors. The idea behind this type of swindle is that the con-man collects his money from his second or third round of investors and then beats it out of town before anyone else comes around to collect. These schemes typically only last weeks, or months at most. There is of course always the temptation to stay around just a little longer to collect another round of investments–especially since each new round has to be bigger than the ones before. But Ponzi made another, equally fatal, error. He became a member of high society and once he had gotten the taste of this life, he couldn’t give it up. Although he started his business as a penniless coupon clipper, by the end of May 1920 Ponzi was able to purchase a palatial home in the banker’s colony of historic Lexington. He also acquired a 38% interest in Boston’s Hanover Trust Bank and became an instant pillar of the community. Ponzi started his scheme on December 26th. Precisely seven months later, on July 26th, at the insistence of the Massachusetts District Attorney, Ponzi quit accepting deposits from new investors. It was estimated that Ponzi had been taking in $200,000 a day of new investments prior to the halt. At that point he had already collected almost $10,000,000 from about 10,000 investors. As word got out about his legal troubles, worried investors swarmed his office. Ponzi confidently greeted them and assured them all was well. He announced he would continue to pay matured notes at face value. Unmatured notes would be refunded in the amount of the original investment for those not willing to wait. He assured investors and law enforcement personnel that he had millions in banks here and abroad, far in excess of his liabilities. From July 26th until he was jailed on August 13th, Ponzi kept up this practice, appearing at the office each day and redeeming bonds from worried investors. During this time he actually redeemed $5,000,000 of his bonds in a futile attempt to convince the authorities that he was on the up and up. At his bankruptcy trial, it was discovered that Ponzi still had bonds outstanding in the amount of $7,000,000 and total assets of about $2,000,000. Indeed, the seemingly lucky investors who redeemed their bonds after July 26th had to return their windfalls to the bankruptcy court to be distributed among Ponzi’s larger circle of creditors. Ultimately, after about seven years of litigation, Ponzi’s disillusioned investors got back 37 cents on the dollar of their principal, with, of course, no whiff of any profits from the nation’s first and most notorious Ponzi scheme. During his trial Ponzi’s attorneys considered a defense of “financial dementia.” Ponzi’s acquaintances testified that for more than twenty years he was obsessed with devising various grand plans for amassing immense wealth. Perhaps, after all, Charles Ponzi believed in his own scheme. The essence of the Ponzi scheme was that Ponzi used the money he received from later investors to pay extravagant rates of return to early investors, thereby inducing more investors to place their money with him in the false hope of realizing this same extravagant rate of return themselves. This works only so long as there is an ever-increasing number of new investors coming into the scheme. To pay a 100% profit to the first 1,000 investors you need the money from 1,000 new investors. Now there are 2000 “investors” in the scheme, and in the second round of payouts to pay the same return to these 2,000 investors in the next round, you need the money from 2,000 new investors–bringing the number of participants to 4,000. And to pay these 4,000, you will end up with 8,000 “investors,” then 16,000–and so on. If all the investors stay in the scheme, the number of participants would double after every round of payouts. Even starting with only 1,000 “investors,” by the 20th round of payouts you would need more new investors than the entire population of the U.S. Eventually, the number of new investors that would have to be found would exceed the population of the earth. Typically, however, Ponzi schemes collapse long before they reach their theoretical limit as an ever-increasing number of new participants cannot be found. In contrast to a Ponzi scheme, dependent upon an unsustainable progression, a common financial arrangement is the so-called “pay-as-you-go” system. Some private pension systems, as well as Social Security, have used this design. A pay-as-you-go system can be visualized as a pipeline, with money from current contributors coming in the front end and money to current beneficiaries paid out the back end. There is a superficial analogy between pyramid or Ponzi schemes and pay-as-you-go programs in that in both money from later participants goes to pay the benefits of earlier participants. But that is where the similarity ends. A pay-as-you-go system can be visualized as a simple pipeline, with money from current contributors coming in the front end and money to current beneficiaries paid out the back end. So we could image that at any given time there might be, say, 40 million people receiving benefits at the back end of the pipeline; and as long as we had 40 million people paying taxes in the front end of the pipe, the program could be sustained forever. It does not require a doubling of participants every time a payment is made to a current beneficiary, or a geometric increase in the number of participants. (There does not have to be precisely the same number of workers and beneficiaries at a given time–there just needs to be a fairly stable relationship between the two.) As long as the amount of money coming in the front end of the pipe maintains a rough balance with the money paid out, the system can continue forever. There is no unsustainable progression driving the mechanism of a pay-as-you-go pension system and so it is not a pyramid or Ponzi scheme. In this context, it would be most accurate to describe Social Security as a transfer payment–transferring income from the generation of workers to the generation of retirees–with the promise that when current workers retiree, there will be another generation of workers behind them who will be the source of their Social Security retirement payments. So you could say that Social Security is a transfer payment, but it is not a pyramid scheme. There is a huge difference between the two, and only a superficial similarity. If the demographics of the population were stable, then a pay-as-you-go system would not have demographically-driven financing ups and downs and no thoughtful person would be tempted to compare it to a Ponzi arrangement. However, since population demographics tend to rise and fall, the balance in pay-as-you-go systems tends to rise and fall as well. During periods when more new participants are entering the system than are receiving benefits there tends to be a surplus in funding (as in the early years of Social Security). During periods when beneficiaries are growing faster than new entrants (as will happen when the baby boomers retire), there tends to be a deficit. This vulnerability to demographic ups and downs is one of the problems with pay-as-you-go financing. But this problem has nothing to do with Ponzi schemes, or any other fraudulent form of financing, it is simply the nature of pay-as-you-go systems. There is one other aspect of Social Security, and many private pension systems, that sometimes leads people to a mistaken analogy with Ponzi schemes, and that is the “bonus” paid to early participants in a pension system. During the start-up of a new pension system the money paid to early participants is usually much in excess of their contributions and higher than the “return” to later participants. This is because people who are nearing the end of their working career will not have an opportunity to participate in the pension system long enough to accrue a significant benefit if computed strictly on an actuarial basis. There are three options: exclude such people from the system; leave them with an inadequate pension; or provide some kind of subsidy to early participants beyond what is justified by their contributions. In private pensions this differential is usually made up by subsidies from the employer. In public pensions this differential is funded by assessing higher taxes than would otherwise be necessary to pay a level benefit to all participants and using these additional taxes to pay higher benefits to early participants. The first recipient of monthly Social Security payments was Ida May Fuller. Miss Fuller worked for about three years under the new Social Security program and paid $24.75 in payroll taxes. Her first Social Security check in January 1940 was for $22.54–she almost got her money back in her very first payment. Miss Fuller lived to be 100 years old and collected more than $22,000 in benefits. This type of “bonus” to early participants should not be confused with the mechanics of pyramid schemes. This type of benefit to early participants in a pension system has nothing to do with an investment scheme using Ponzi-like progressions to show false returns to early participants. In private pensions this bonus is simply an expression of the employer’s beneficence. In public pensions it is an expression of public policy. In the context of the early years of the Social Security program it was an expression of a public policy which held that workers already old should not be turned away penniless. This spirit of public generosity has nothing to do with Ponzi schemes. Social Security is and always has been either a “pay-as-you-go” system or one that was partially advance-funded. Its structure, logic, and mode of operation have nothing in common with Ponzi schemes or chain letters or pyramid schemes. The first modern social insurance program began in Germany in 1889 and has been in continuous operation for more than 100 years. The American Social Security system has been in continuous successful operation since 1935. Charles Ponzi’s scheme lasted barely 200 days.